Food, Glorious Food, what more can we ask for? Kosher college food? Are you thinking about packaged airline meals sitting in gooey sauce of questionable origin, rubbery eggs, rock hard bagels, and chicken that seems capable of walking away on its own two feet? Think again! 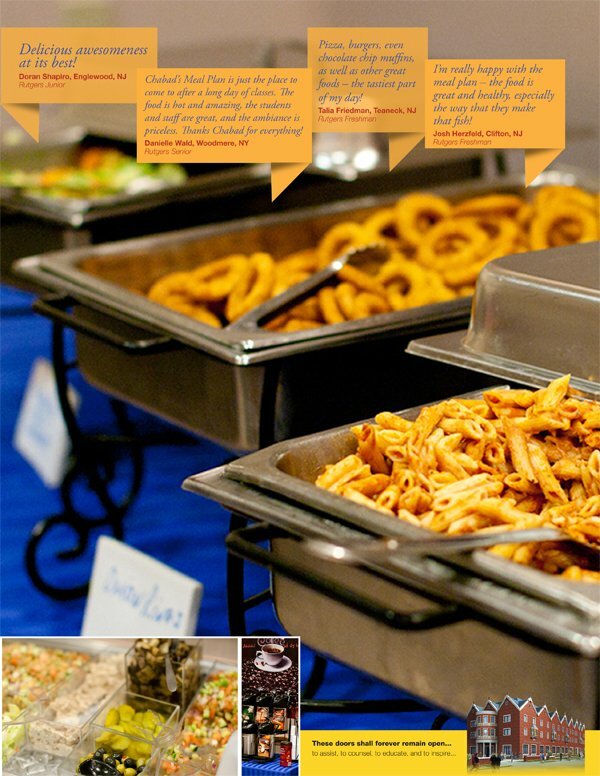 The Chabad meal plan at Rutgers with its International Food Court offers delicious, healthy, and varied meals. As senior Yael Novick raves, "the Chabad Meal Plan offers a delicious variety of everyone’s favorite foods, including baked ziti, eggplant parmesan, French fries, lean sizzling grilled hamburgers, and a full salad bar – all very nutritious and delicious!" Other options include pizza, falafel, overstuffed hero sandwiches, pepper steak, tacos, wraps, grilled vegetables, burritos, and a variety of hot soups and fresh fruits. Chefs Chezky Adler and Arye Spilman have a combined 30 years of experience. They take pride in these varied, innovative menus, new coffee bar and other novel ideas including themed evenings such a Mexican Fiesta Shabbat. Certainly the kosher meal plan helps students who are strictly kosher to gain a stellar Rutgers education without being forced to subsist on cold salads and fruit. Dr. Anne Arenson Winter asserts that the kosher meal plan, which enables her two children Rachel and Avi Kemp to continue observing kashrut according to their strict standards, was one of the major factors in their choosing Rutgers. But, the dining plan is hardly for kosher students only. The Chabad House is the go-to place for students seeking social and cultural activities as well as a warm inviting atmosphere where they can hang out in comfortable lounges, work out using state-of-the-art equipment, study in the library. Regardless of kashrut level, it’s simply fun and convenient to share delicious food with good friends. Oh... those 700 meals? They are absolutely free to student guests. This standing invitation is simply the Chabad way of welcoming students who want to experience a traditional Friday night or Shabbat meal. And now... a great thing is getting even better. The new extension is designed with a 7,700 sq. ft. dining area, which will have a stage and double as an auditorium. The area will be large enough to seat 770 students! (Yes, you read correctly: 770 young men and women will be able to enjoy kosher meals together at Chabad!) Two new kitchens and an expansive area to store food and supplies, yielding a combined footprint of 4,000 square feet, will make it possible to gain revenue and offset costs by holding large catered events at the Chabad House. A loading dock will facilitate safe and efficient delivery of supplies. Hungry yet? Come, visit, tour our new kitchens, and break bread with us at Chabad. No reservations needed!